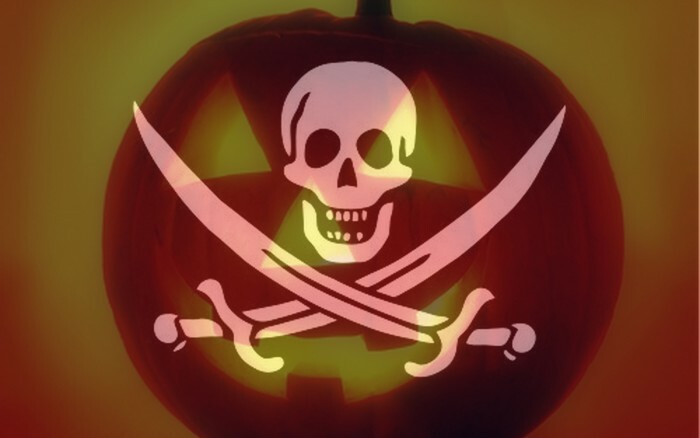 Halloween: Listen for shortwave pirates! Halloween is typically the most active day of the year for shortwave pirates. Halloween falls on Wednesday, October 31st, and although this is the middle of the week, expect pirates to emerge like The Great Pumpkin! This entry was posted in News, Pirate Radio, Shortwave Radio and tagged Halloween, Pirate Radio, Pirate Radio Halloween, Shortwave Pirates on October 31, 2018 by Thomas. I had hoped this Halloween weekend would bring out a lot of shortwave pirates and it surely did! At one point Monday evening, I noted no less than five pirate radio stations broadcasting simultaneously between 6910 – 7000 kHz. 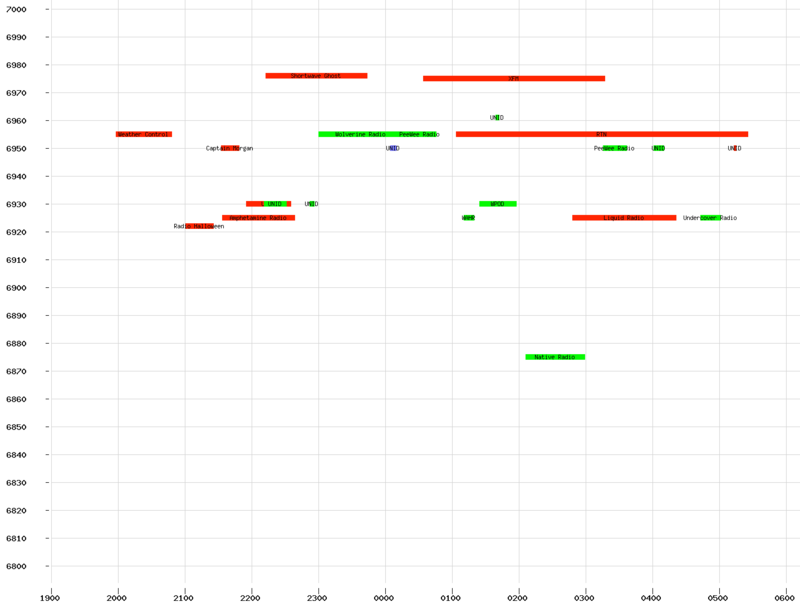 You can see the four SSB and one AM signal in the spectrum display above. Chris Smolinski, once again, has posted a Summary of Halloween 2016 Shortwave Pirate Radio Activity in North America where he lists all of the pirates logged on the HF Underground for the full weekend. Check out the post on RadioHobbyist.org. I was busy with family activities much of the weekend, but fortunately captured a lot of pirate spectrum to review and listen to later! This entry was posted in News, Pirate Radio, Shortwave Radio, What's On Shortwave and tagged Chris Smolinski, Pirate Radio, Pirate Radio Halloween, Shortwave Pirates on November 2, 2016 by Thomas. A Great Pirate QSL Card! 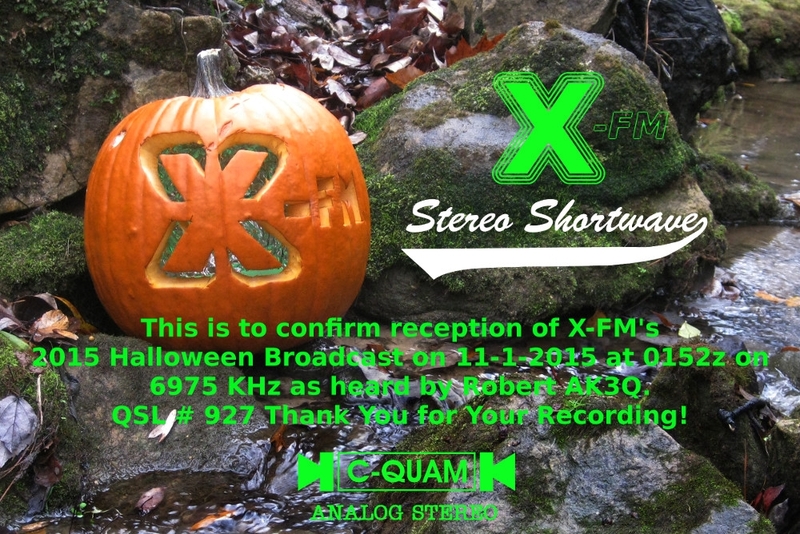 Here’s a great example of a QSL report from Pirate Station X-FM Stereo Shortwave monitored Halloween 2015. Not only is it a beautiful card, Redhat (the Deejay) also included the playlist as a .txt attachment. As I recall he also made live announcements of who had left reception reports/comments on the HF Underground forum as well as for those who sent him emails directly. I sent a short recording as part of my reception report, and it was an added bonus to see that mentioned in his QSL card. I am quite impressed with all the effort made to turn out a quality QSL card, but a Pirate transmitting in stereo obviously appreciates quality!! Pirate Radio receptions are memorable events on their own, but the QSL cards really make them special! Happy Pirate hunting! This entry was posted in News, Pirate Radio, Shortwave Radio and tagged AM Pirates, Pirate Radio Halloween on July 19, 2016 by Robert Gulley. Many thanks to Chris Smolinski, from the HF Underground, who has crunched some numbers from North American pirate radio loggings on Halloween. 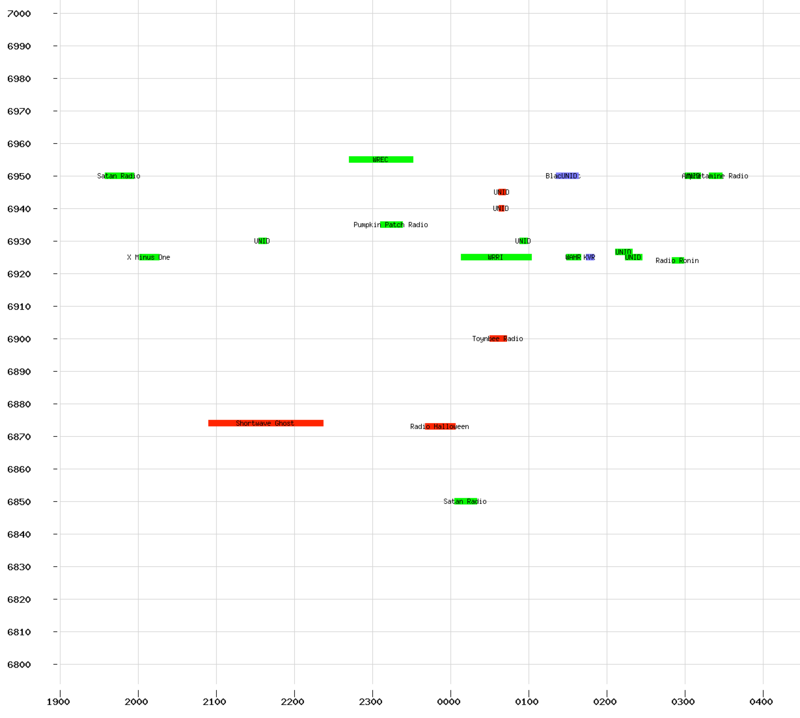 The number of pirates (and his charts with times and frequencies) are most impressive and informative. Here are two charts showing who-was-on-when-and-where this Halloween. This entry was posted in News, Pirate Radio, Shortwave Radio, What's On Shortwave and tagged Chris Smolinski, Halloween, HF Underground, Pirate Radio, Pirate Radio Halloween, Shortwave Pirates on November 2, 2015 by Thomas.